Redefining full employment … again! In the 1980s, as high unemployment persisted following the 1975 OPEC oil shock and the stagflation that accompanied it and then the 1982 recession and its aftermath, neo-liberals started to seek new ways of justifying the lack of government action in restoring full employment. Being very clever, they came up with an ingenious solution – redefine what full employment means. So as the unemployment rate rose they claimed that the so-called “equilibrium unemployment rate” had also risen which meant that attempts to reduce it by expansionary policy would be inflationary. They claimed the only way the government could act was to initiate “structural reforms” aka privatisation, labour market deregulation, anti-union legislation and harsh welfare measures. Why should we be so surprised that they are at it again? The truth is that recessions cause structural imbalances which are corrected again if economic growth is strong enough in the post recession phase. Post-recession America may be saddled with high unemployment even after good times finally return … Hundreds of thousands of jobs have vanished forever in industries such as auto manufacturing and financial services. Millions of people who were fired or laid off will find it harder to get hired again and for years may have to accept lower earnings than they enjoyed before the slump. Former Fed Chairman Paul Volcker has called this alleged restructuring of the US economy “the Great Recession” and now there are renewed claims from conservative economists that the Non Accelerating Inflation Rate of Unemployment (the so-called NAIRU) is rising again. For my critical views on the NAIRU as a concept you might like to read this earlier blog – The dreaded NAIRU is still about!. The article quotes US economist Edmund Phelps who says that the recession will cause a “markedly higher natural rate of unemployment … It was 5.5 percent; maybe it will be 6.5 percent, maybe 7 percent.” Phelps is one of the early natural rate theorists who claimed that government attempts to use aggregate demand policies (fiscal and monetary expansion) to reduce unemployment would be self-defeating and only cause ever accelerating inflation. That has implications for policy makers as well as workers. The Obama administration and the Federal Reserve are counting on the jobless rate to fall to a medium-term equilibrium of about 5 percent as the economy recovers. A natural rate significantly above that would drive up the annual budget deficit — which will top $1 trillion for the first time this year — by reducing tax revenue and pushing up spending on unemployment benefits … A higher rate would also require the Fed to make a choice: Accept an economy with more Americans permanently out of work, or try to boost employment at the risk of heating up inflation. So these mutterings represent the beginnings of the attack on government intervention that will gather pace once economies around the world start to grow again. There will be an attempt by the neo-liberals to reclaim the ground they have lost by leading the World into this crisis with their unsustainable policies based around a religious faith in the free market. We are back to the NAIRU and aggregate policy inaction. There will be a renewed attempts to widen deregulation and privatisation initiatives and place further pressure on welfare recipients. It is back to that … if we allow it! The characters have no shame at all! Howver, it is not a new debate and the substantive claims were shown to be categorically false when they were raised during the 1980s. Recent policy orientation in the U.K., the U.S.A. and in Australia is based, it seems, on the view that inflation is the basic constraint on expansion (and fuller employment). A popular belief is that fiscal and monetary policy can no longer attain unemployment rates common in the sixties without ever-accelerating inflation rate of unemployment. The natural rate of unemployment (NRU) which is the rate of unemployment consistent with stable inflation is considered to have risen over time … labour force compositional changes, government welfare payments, trade-union wage goals among other “structural” influences are implicated in the rising estimates of the inflationary constraint. In that research, I showed that the increasing NAIRU estimates (based on econometric models) merely reflected the decade or more of high actual unemployment rates and restrictive fiscal and monetary policies, and hence, were not indicative of increasing structural impediments in the labour market? I also showed that there was no credibility in the claims that major increases in unemployment are due to the structural changes like demographic changes or welfare payment distortions. For the technically minded you might like to read the original article which appeared in Australian Economic Papers, December 1987 which has the formal theoretical model and econometric analysis. Australia has recently witnessed growth in employment, which has compared favourably with contemporary trends in job creation in other economies and with our own historical achievements. Despite the growth, we have not seen a large decline in the national unemployment rate. Various explanations have been offered to explain this disturbing paradox. A popular account suggests that the full employment unemployment rate (FNUR) has risen from around 2 per cent in the 1960s to 8 per cent in the 1980s. So the claims are not new. My earlier work showed that demand deficient unemployment occurs when the number of people wanting gainful employment exceeds the number of vacancies being offered. The composition of the unemployed relative to the skills demanded is not the binding constraint. Structuralists suggest that structural imbalances can originate from both the demand and supply sides of the economy. Technological changes, changes in the pattern of consumption, compositional movements in the labour force and welfare programme distortions are among the pot-pourri of influences listed as promoting the structural shifts. The distinction between demand deficient and structural unemployment is usually considered important at the policy level. Macro policy will alleviate demand deficient unemployment, while micro policies are needed to redress the demand and supply mismatching characteristic of structural unemployment. In the latter case, macro expansion may be futile and inflationary. But this work was part of a new research agenda that was able to show that structural changes were in fact cyclical in nature – this was called the hysteresis effect. Accordingly, a prolonged recession may create conditions in the labour market which mimic structural imbalance but which can be redressed through aggregate policy without fuelling inflation. I produced a theoretical model which showed that any structural constraints that emerge during a large recession (more about which later) can be wound back by strong fiscal policy stimulation. This was my main PhD contention. I also produced several empirical articles during that period to verify the claims. Recessions cause unemployment to rise and due to their prolonged nature the short-term joblessness becomes entrenched long-term unemployment. The unemployment rate behaves asymmetrically with respect to the business cycle which means that it jumps up quickly but takes a long time to fall again. But this behaviour has to be seen in the context of the policy position that the national government takes at the time of the recession and the early recovery period. As I show below, this has made a significant difference in Australia. It is true that once unemployment reaches high levels it takes a long time to eat into it again because labour force growth is on-going and labour productivity picks up in the recovery phase. You need to run GDP growth very strongly at first to absorb the pool of idle labour created during the recession unless you provide a strong public employment capacity that is accessible to the most disadvantaged (for example, this is what the Job Guarantee is about!). It is also the case that if GDP growth remains deficient then the idle labour queue will remain long and employers will use all sorts of screening devices to shuffle the workers in the queue. They increase hiring standards and engage in petty prejudice. A common screen is called statistical discrimination whereby the firms will conclude, for example, that because on average a particular demographic cohort is unreliable, every person from that group must therefore be unreliable. So gender, age, race and other forms of discrimination are used to shuffle the disadvantaged from the top of the queue. The long-term unemployed are also considered to be skill-deficient and firms are reluctant to offer training because they have so many workers to choose from. But to understand what happens during a recession we need to consider the cyclical labour market adjustments that occur. The hysteresis effect describes the interaction between the actual and equilibrium unemployment rates. The significance of hysteresis is that the unemployment rate associated with stable prices, at any point in time should not be conceived of as a rigid non-inflationary constraint on expansionary macro policy. The equilibrium rate itself can be reduced by policies, which reduce the actual unemployment rate. The idea is that structural imbalance increases in a recession due to the cyclical labour market adjustments commonly observed in downturns, and decreases at higher levels of demand as the adjustments are reserved. Structural imbalance refers to the inability of the actual unemployed to present themselves as an effective excess supply. The non-wage labour market adjustment that accompany a low-pressure economy, which could lead to hysteresis, are well documented. Training opportunities are provided with entry-level jobs and so the (average) skill of the labour force declines as vacancies fall. New entrants are denied relevant skills (and socialisation associated with stable work patterns) and redundant workers face skill obsolescence. Both groups need jobs in order to update and/or acquire relevant skills. Skill (experience) upgrading also occurs through mobility, which is restricted during a downturn. An extensive literature links the concept of structural imbalance to wage and price inflation. It can be shown that a non-inflationary unemployment rate can be defined which is sensitive to the cycle. Given that inflation typically results from incompatible distributional claims on available income by firms and workers, unemployment can temporarily balance the conflicting demands of labour and capital by disciplining the aspirations of labour so that they are compatible with the profitability requirements of capital. This is the underlying reason why inflation targetting uses unemployment and a policy tool rather than as a policy target! Wage demands are thus inversely related to the actual number of unemployed who are potential substitutes for those currently employed. Increasing structural imbalance (via cyclical non-wage labour market adjustment) drives a wedge between potential and actual excess labour supply, and to some degree, insulates the wage demands of the employed from the cycle. The more rapid the cyclical adjustment, the higher is the unemployment rate associated with price stability. Stimulating job growth can decrease the wedge because the unemployed develop new and relevant skills and experience. These upgrading effects provide an opportunity for real growth to occur as the cycle reduces the unemployment rate that might be associated with stable inflation. In my PhD thesis I called this the Macroeconomic Equilibrium Unemployment Rate to distinguish it from the conservative NAIRU concept (which at the time was claimed to be cyclically invariant). Why will firms employ those without skills? An important reason is that hiring standards drop as the upturn begins. The faster is the recovery the more quickly the hiring screens are taken away as firms are forced to compete for available labour resources. Rather than disturb wage structures firms offer entry-level jobs as training positions. So the imbalances that arise as the economy goes under are stripped away in the new growth period. New jobs, new technologies emerge but a strongly growing economy forces firms to offer training and capacity building. If the recovery is tepid, then these upgrading effects are lost or a very slow to emerge. This is a fundamental reason why the national government should: (a) keep fiscal policy strong (in deficit) to avoid recessions in the first place; but (b) make sure they react very quickly to imported shocks that will drive the economy into recession. I created some indexes to investigate the proposition that if economic growth is fast enough in the post-recession phase then unemployment will fall fairly quickly. So the asymmetry is due to the economy languishing for too long in a state of low growth. The following graph presents the evolution of Gross Domestic Product (GDP); Unemployment (UN), Employment (EMP) and the Labour Force (LF) in the recovery phases out to 4 years (in quarters) for the 1961, 1982 and 1991 recessions. The indexes start at 100 in the quarter GDP growth resumed. So you see that unemployment (and unemployment rates which are not shown) fell very quickly during the relatively short 1961 recession but actually kept growing in 1991 as the economy resumed growth. In 1991, unemployment kept rising for around 2 years after the economy had officially started growing again. 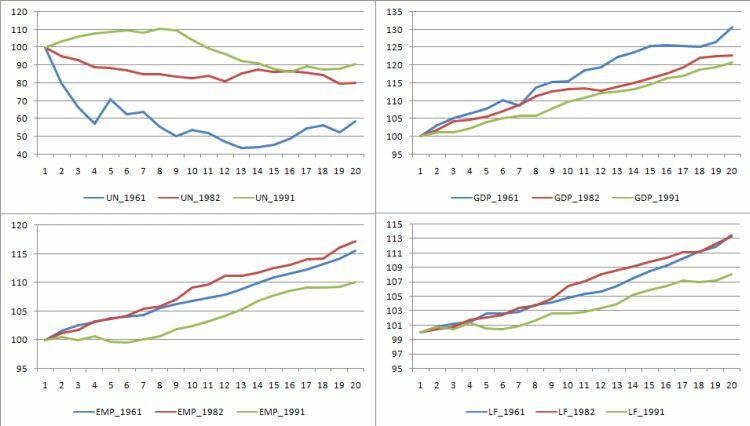 You can see that in 1961, GDP growth was much stronger once growth resumed. This was a period when the national government took strong policy action to repair the spending loss and get output growth going as quickly as possible. You can also see that labour force growth was similar in 1961 and 1982. But in 1991, the sluggish labour force growth actually took pressure off the labour market and kept the unemployment rate down lower than it otherwise would have been. This sort of policy reaction was absent in the 1982 and 1991 recessions. The Federal government kept saying in 1991 that we would experience a soft-landing after squeezing the hell out of the economy with fiscal surpluses and record interest rates. They were also too slow to react when it was clear that the recession would exact a very significant unemployment toll. The next graph depicts what are called “butterfly charts” and they help to show the movements in unemployment before the recession, during the peak-to-trough period, and then in the early growth phase. They show the evolution of the unemployment rate for the 1961, 1982 and 1991 recessions starting 4 quarters before the unemployment rate reached its lowest point and then 12 quarters after that point which includes the GDP peak to trough period. The butterflies are indexed to 100 at the highest unemployment rate. The 1961 event peaks quickly and dissipates quickly whereas the other extreme is the 1991 recession where the unemployment rate kept rising long after the GDP trough. 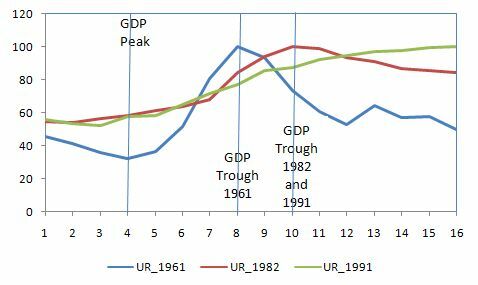 The 1982 recession sees the UR peak correspond with the GDP trough quarter but slow adjustment is still evident in the early growth phase. The point of all of this is to question the assumption that unemployment will always be slow to fall after a prolonged recession. It is true that as the economy resumes growth, firms make adjustments to hours of work before they put new staff. But when GDP growth is robust enough (aided and abetted by strong public sector intervention) then inroads into unemployment come much more quickly. So the concept of a rising NAIRU is hardly novel. It have been wheeled out in every major recession that has occurred since the NAIRU entered the literature in the late 1960s (as the natural rate). The NAIRU concept is totally bereft – on theoretical and empirical grounds (this is what my latest book – Full Employment Abandoned with Joan Muysken is partly about). The reality is that labour market imbalances and cyclical adjustment processes do occur during recessions. But these processes also unwind again when the economy grows. The faster is the GDP growth the more quickly the firms get to the end of the labour queue and are forced by market pressures to take on the long-term unemployed and other disadvantaged workers and offer them the requisite training. If the national government allows the economy to languish with tepid growth in the recovery then this queue lengthens initially and takes years to start shortening again. The resulting monumental waste of human capacity is directly attributable to poor macroeconomic policy interventions driven by neo-liberal misconceptions. And to put it in finer relief: the national government in most countries (if they are sovereign in their own currency) can prevent the jobless queue from increasing in the first place by creating a buffer stock of public sector jobs that they unconditionally offer to anyone who wants to work at the minimum wage. This is the Job Guarantee. We have to keep combatting these attempts to evade the responsibility of our national governments to maintain full employment. Full employment will always be defined as 1-2 per cent unemployment (to allow for movements between jobs and regions etc) and zero underemployment. Any deviation from that is the fault of the national government and they should be judged accordingly. I have added a new page (see right menu under Other Information) called Comments Policy to articulate the policy I have towards Comments (duh!). If anyone thinks it is unreasonable then please feel free to contact me with suggested changes within the spirit of this overall policy intent. I think that rather than fix the problem the governments agenda is to hide the hyteresis effects from the figures. As such the new proposals for youths and LTU persons would appear to confirm my suspicions. Side Note: Wayne Swan is completely HONKING!!!!! when it comes to economics. He’s so bad I’m waiting for Alan Funt to appear and show us where they hid the camera. I don’t understand how you can advocate continuous budget deficits. Surely, you’d end up with a situation where there is a crippling interest burden on the budget. Am i missing something? Have a browse through the rest of the blogs on this site. A good place to start is to read Deficits 101 – Part 1; then Deficits 101 – Part 2; then Deficits 101 – Part 3 to see why there will be no crippling interest burden. In the Post WWII period, surpluses have been the fashion for the last 10-15 years or so. Before that we ran continuous budget deficits and built the nation. No inflation, no crippling interest burden and continuous full employment. If you still have issues after more reading come back and I will be happy to answer any specific questions. I was watching the ABCTV Morning program today and was quite alarmed at how representatives of the Centre of Independent Studies (CIS) were providing their NeoPhillia Economics to the masses. It was all in there as well I might add – Ricardian Equivalence, Gold standards, Malthusianism, GBC woes. What really grinds my gears is that good people like AL here may actually watch the ABC hoping for an alternative (the truth) viewpoint and be basically told lies by people like the CIS economists whom should know better. Oh, I almost forgot, they were also discussing households whereby no member actually has a job. They gave all types of supplyside micoeconomics reasons except the most important macro / deamnd side one – the lack of jobs / hours available. You are a glutton for punishment watching morning TV. I presume you were referring to ABC-2 Morning Show. They just pump out the usual propaganda about budget black holes etc. But ABC Radio National yesterday also had the CIS woman on talking about their latest research on integernational disadvantage. It was also very very supply-side – more welfare cuts, lower real wages etc. Richard Aedy didn’t challenge any of the most preposterous statements and merely finished the segment by disclosing that the woman was from a “libertarian think tank”. I recall him interviewing me relatively recently and he was definitely not as kind. I guess my position is easier to isolate as being of the “mad scientist” variety and her position is now mainstream. But just go for a surf in the morning Alan and avoid the TV. Thanks for your response. I’ve read through your articles but I’ve still got some questions. If the government doesn’t finance deficit spending with debt, then the alternative is for it to create more money itself. Is that right? That leads me to ask, who creates/prints money? Is it the Treasury or the Reserve Bank? If the government doesn’t finance deficit spending with debt, then the alternative is for it to create more money itself. Is that right? This is not really correct. The debt doesn’t provide the Government with any “money”. It just drains the liquidity (reserves) from the banking system that the deficits have added in the first place. The important point is that irrespective of what else the Government does it always spends by crediting bank accounts or writing cheques. The net impact of a deficit is that reserves increase in the banking system. The Government may then offer the private sector government debt if they want to drain these excess reserves (usually for monetary policy reasons – to allow the central bank to maintain its target interest rate). Have a read of some of the earlier blogs – Deficits 101 Part 1; Deficits 101 Part 2; and Deficits 101 Part 3 to work all this out. That leads me to ask, who creates/prints money? Is it the Treasury or the Reserve Bank? Well the mint prints notes and coins but that is nothing to do with government spending. The Treasury instructs the RBA to credit bank accounts in the commercial banks (via the Exchange Settlements Accounts that the commercial banks keep with the RBA for clearing house purposes) when it wants to spend. That is how spending enters the economy. It might also occur via the RBA issuing a Treasury cheque for some transfer payment. Same result though the spending ends up in bank reserves.